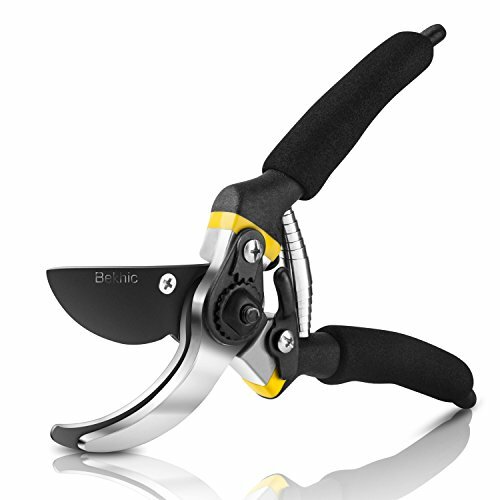 SAVE EFFORT WITH TENSION SPRING: These pruning shears have a heavy-duty telescopic spring, giving you extra power with each cut. You'll only need a minimal amount of pressure to cut through thick fibrous stems and woody twigs. TRIM PERFECTLY WITH PRECISION STEEL: Putting a finishing touch on a manicured shrub or cleaning up leaves on your indoor plants? Made with sharp precision steel, these bypass shears make accurate cuts, so you can get the perfect trim every time. NO MORE HAND FATIGUE: These garden clippers are ergonomically designed to absorb pressure so your hands don't have to. The shock absorbent cushion and comfortable handles keep cramps and fatigue at bay, so you can feel fresh and trim in comfort. ;KEEP YOUR GARDEN HEALTHY: Trimming your trees and plants is essential to maintaining a healthy garden. Pruners can cut up to 3/4" diameter size tree branches.This may vary depending on tree species.